CENSOR THEATRE EARLY ALBION CINEMA Morning Star, January 13, 2002, pg. 19 A few weeks ago in this column we featured George N. Davis, who was one of the principle builders of the Albion Opera House building in downtown Albion. In addition to its upstairs main attraction, the first floor of this building also housed various merchantile enterprises through the years. One long-time business was the Hadley H.
Sheldon Drugs & Wallpaper store located in the south half (225 S. Superior St. ) of the building where Dr. Judy Warren’s dental practice is located. I’ve always wondered what the close relationship between drugs and wallpaper was. The other business was the Censor Theatre in the north half (223 S. Superior St. ), an early 20th century entertainment place for many years. The Censor Theatre had been opened by druggist Sheldon (1865-1963) on August 14, 1915. Silent motion pictures was a growing fad in those days, and Albion had several theatres operating by the end of World War I. Sheldon still operated the Opera House upstairs with live entertainment, but it was evident that motion pictures was taking over the entertainment industry of the day. Sheldon sold the Censor Theatre to George A.
Bohm (1890-1951) in 1916. Bohm had opened his first “Bohm’s Theatre” in the east half of the historic Commercial Hotel building (108 W. Porter St. ) in 1915. The move to the Censor gave George more room to build his business and establish himself as the “king of motion pictures” in Albion. He was aggressive in outwitting any competition in town. Back in those days picture film was highly flammable and volitile, and state laws were passed regulating theatres, especially those located on second floors. In order to reduce competition with his Censor Theatre, George complained to the Fire Marshal and had the Albion Opera House upstairs declared a fire trap, and thus it was closed in 1918. Projectionist at the Censor was George’s brother Albert Bohm (1887-1960), and organist was Mrs. Marian Embury. George ran the Censor for over a decade, and established his reputation of providing entertainment for the entire family. He would throw children’s Christmas parties and would pack the theatre for these events, a policy he continued throughout his lifetime. The first “talkie” movie that came to Albion was shown at the Censor Theatre in May, 1929; it was a film entitled “The Bellamy Trial. ” This new innovation in motion pictures had been anticipated, which further propelled George to increase his business. During the 1920s, the Bohm Theatre at 201 S. Superior St.
was built and opened on Christmas Day, 1929. The Censor Theatre was thereby closed after fifteen years in existence, and George Bohm moved his operation to his new spacious facilities. Today we are fortunate that the Bohm Theatre is still in existence in downtown Albion providing current-run films, although you have to look under the “Ns” in the phone book to get their telephone number. It’s now called the “New” Bohm Theatre. Sort of like “New and Improved Tide. ” I liked the original name better. 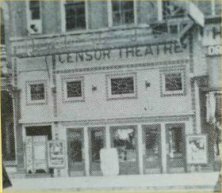 From our Historical Notebook this week we present a photograph of the Censor Theatre as it looked shortly after George Bohm took it over in 1916. Notice on the far left where the entranceway to the Albion Opera House is, that George placed a theatre poster stand in front of it to block access. Even back then he apparently had ideas of closing the upstairs entertainment competition. Above the Censor sign is the old steel fire escape steps, which could be lowered to the sidewalk during a fire. Several downtown Albion buildings once had these features installed in the early 1900s.